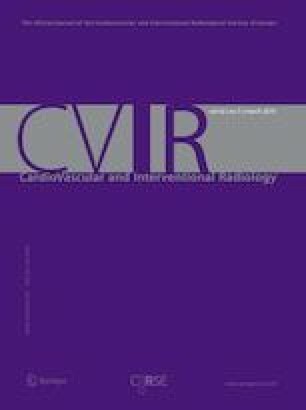 Comparing total fluoroscopy time (FT) to perform uterine artery embolization (UAE) with transradial approach (TRA) versus transfemoral approach (TFA). Our hypothesis was that there would be no significant procedural time penalty incurred, despite the learning curve associated with adopting a new approach. A cohort study was undertaken including 66 consecutive patients undergoing UAE with either TRA/TFA between January and September 2015. Total FT was recorded prospectively for each procedure, and data subsequently analyzed retrospectively. Each operator had at least 2 years of experience as an interventional radiologist having performed at least 200 TFA UAEs. All operators had recently incorporated TRA into their practice. A total of 39 TFA and 27 TRA cases were included in the study; mean age for TFA group was 44.4 years (± 4.9) and for TRA group was 45.1 years (± 4.9) (p = 0.59). Mean FTs were comparable between the two groups (p = 0.86) despite a learning curve associated with TRA: The mean total FT with TFA was 20.36 min (± 9.48) compared to TRA 20.12 min (± 7.67). FTs for TRA UAE were comparable to TFA UAE, even though TRA had been recently adopted as a new approach. Despite the learning curve associated with developing a novel technique, operators should not expect the efficiency of their service to be significantly compromised. Introducing this safe and effective method of vascular access should therefore be considered. Dr. Mortensen, Dr. Ho and Dr. Legiehn declare that they have nothing to disclose. Dr. Chung reports personal fees from Merit Medical, personal fees from Boston Scientific, outside the submitted work. Dr. Liu reports other (independent director) from Merit Medical, grants from Seimens Medical, outside the submitted work. Dr. Machan reports other (medical advisory board) from Boston Scientific Corp, other (scientific advisory committee) from Cook Inc, outside the submitted work. Dr. Klass reports personal fees from Merit Medical, personal fees from Cook Medical, personal fees from Phillips Healthcare, personal fees from Liva Nova, grants from Biolife, outside the submitted work.